I struggle with being productive, as I'm sure you do as well. I think most writers run into issues productivity killers. I don't know about you, but I'm easily distractible. It could be anything from a TV show, to my son wanting to play, to a game, or a book that I want to read. Or even just checking email or social media. I even have the RescueTime app installed on my computer to help me with this issue. 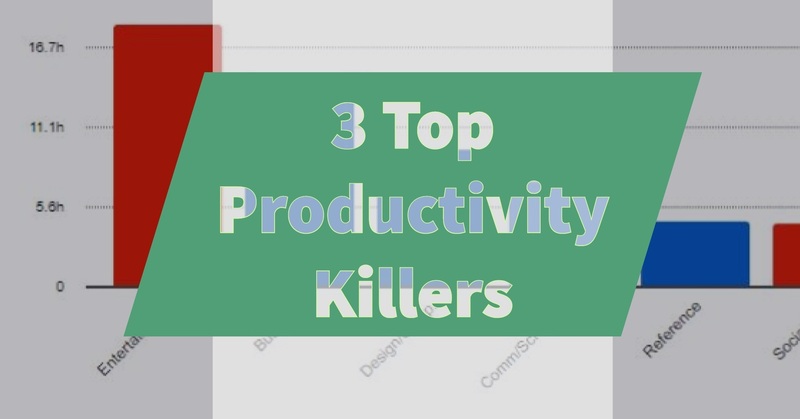 I've identified three common productivity killers that I run into—and I think that most writers probably deal with these as well. 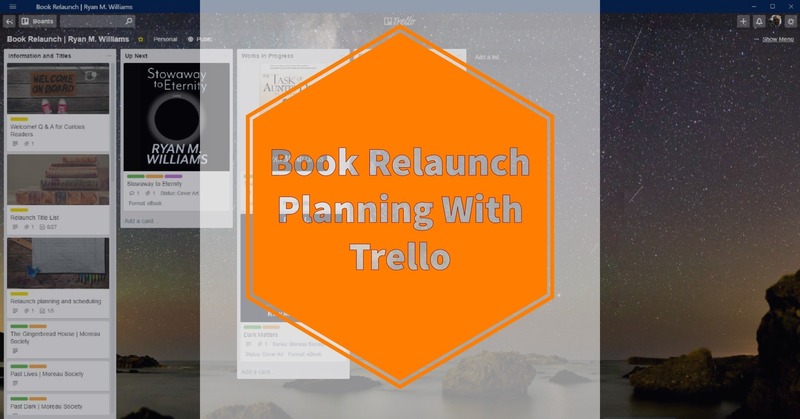 Book relaunches take planning. I have 24 books to relaunch in my backlist, plus new books that I'm writing. To help me keep everything organized I use Trello. I'm going to show you my simple Trello board and talk about how I'm using it to help stay focused on on track for this project. I am relaunching my writing career this year, planning to move the dial from very few sales to the bestseller ranks. With twenty-four titles including new and previously published titles, I have a lot of work to do. It's easy to get frustrated that I'm not moving faster. I am embracing the tortoise approach to self-publishing. I'm picking my steps to make incremental progress. One thing at a time. Otherwise, it quickly gets too overwhelming. I have a bunch of previously published novels that I want to reissue. I published some under my name, others under pen names, but I plan to bring them back out under my name. I want to change my print-on-demand (POD) approach to move Amazon paperbacks over to the Kindle Direct Platform (KDP) from CreateSpace, move expanded distribution to IngramSpark, add hardcover editions via IngramSpark, and add large print editions on IngramSpark as well. That means I'll have four versions of each book across different formats and platforms. Then there are e-book editions of each novel. I plan to go direct with KDP, Kobo, and run the rest through Draft2Digital. The new editions of the books will have new covers (and different print formats require changes there too). Designing and illustrating my own work may not be the best approach from a strictly commercial view. I'm doing it because I love doing illustration work. The artwork hasn't been what I want—yet. I'm getting better and continue to learn. I also plan to check the interiors to catch mistakes that might have been missed in previous editions. Then beyond all of that are other things I want to do with the books, such as audiobook versions, other language editions, merchandising, and other projects around my work. That doesn't even begin to tackle marketing, email lists, and promotion. That's too much! Rather than tackle all of that right now, I plan to take one step at a time. I can create new cover art and update the e-book. I can put the books back up that I took down from Kobo and Draft2Digital to try out Kindle Select. I can create KDP paperbacks even if I don't have the hardcover editions done yet. It doesn't all have to happen right now. The key is just taking those steps, one after another. I hear about writers putting out a book each month and other high-productivity efforts. That's great! I'm glad it works for them. I'd like to increase my production rate, but right now I plan to continue at a pace I can manage. That's okay too. As I relaunch my writing career I try to do something each day that will help me move it forward. Today I wrote ~1,500 words between the blog post, finishing one short story, and starting another story. I listened to podcasts to help me improve. I practiced drawing by creating the pattern for this entry's featured image. I'd love to hear what steps you're taking to move your creative practice forward! Share your thoughts in the comments. Writing doesn't take much time. If you figure on a 1,000 words per hour pace, you can plan how much time you need to write a novel. If it's an 80,000-word novel—80 hours. At a 17 Words Per Minute (WPM) typing speed. You could cut the time in half simply by typing at a 34 WPM rate. The bigger question isn't how fast you can type. Without deliberate practice and focus on your typing speed it probably won't change much. The real question is when can you fit in the 80 hours, 40 hours, or 120 hours it will take to write your novel? That comes down to goal setting. Goals cut both ways. They can help you slash through distraction—and they can gut you when you fail to meet your targets. It gets even worse when you consider that most of us go through our days juggling dozens of different goals. If you're like me and have a career outside of writing, you'll have goals for that career. It may take up most of your time and energy. You may have goals around your family. Your health. And goals related to your creative practice. Often we don't think about all of these as goals. We might consider some to simply be tasks that need to be completed. A task might be mowing the lawn because it is the first sunny day we've had in weeks. You could even say that your goal is to have a lawn that looks good and the task of mowing is just one of the things that you do to reach that goal. That's fine. Taking care of the lawn is one of those never-ending goals, same as taking care of your own health, and it is evaluated at any moment when you ask yourself if you are meeting the goal. People also like to talk about projects as larger efforts that might contain many goals with related tasks. You might consider writing a novel a project. Whatever term you choose to use—your life is full of things to do. Your boss giving you an assignment is their way of accomplishing a goal (or several goals). In turn, you create goals based on that assignment, e.g. don't get fired for not getting the work done. Often we have less resistance when given external goals that are tied to “work.” We get up and go to work each day. We work to reach our goals as well as organizational goals. Often it isn't the same with our creative practice. For one thing, it runs into other goals, ours and other's goals for us. I might want to spend the day writing and working on illustrations but I also need to do our taxes. I have other chores to do. My family also has goals for me. My son wants to play or code together. Our families understand that our jobs will take a great deal of our time. Naturally, they want to spend time with us when we're home. That's great! I definitely want to spend time with my family too, and I'm endlessly grateful that I have a family. I'm also fortunate in that they are also creative and artistic people. They have their own creative practices too. With that in mind, I need to set realistic (and challenging) goals. I can't compare my productivity to someone else. What they're doing doesn't matter. I need to figure out what works for me. I might want to write a new novel every two weeks, spending 40 hours per week. That's not going to work with everything else in my life. Instead, I need to work back from what it will take to write a novel. If I need 80 hours to write the book, how much time can I spend on it each day? Let's say that I figure I can manage a half-hour on my lunch breaks to work on the novel. That's about 500 words or 2,500 words during my work week. If I don't do any extra on the weekend it'll take 32 weeks to write the book. If I don't take days off I can finish it in 23 weeks. Figure that I'm bound to miss some days and call it 6 months to be safe. That gives me confidence that I can meet that goal. Write a novel in 6 months by writing 500 words per day, 7 days per week. That also lets me use streak-tracking to help with my motivation on the book. I'll need to change parameters if I want to complete the book faster. Write more than 500 words (either by spending more time or increasing my speed). I need to keep my other goals in mind, things like blog posts, short stories, publishing, marketing, and illustration. Plus everything else in my life. I don't write in a void. What tips do you have for setting goals? How do you balance your career and creative practice? Share in the comments. True words. Over the past few days, my sites came under attack from hackers. The code infested everything. 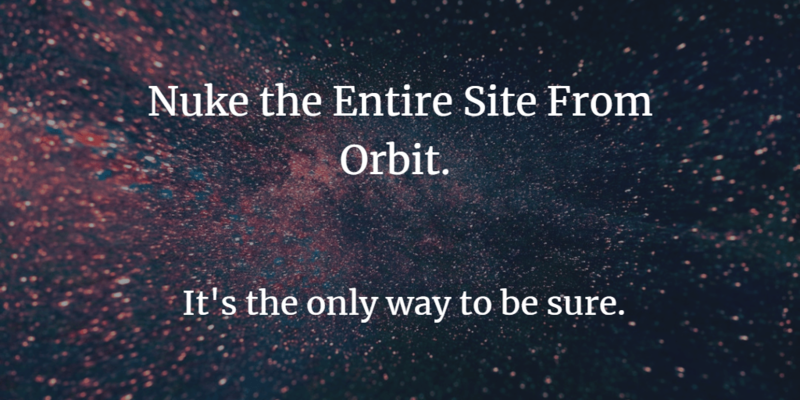 No sooner would I strip it out and try to secure one site, I would discover it somewhere else. I decided to take Ripley's suggestion to heart. My sites might not be a multi-million dollar installation, but it's hard to do something like that after having spent so much time working on the sites. No doubt there were less radical methods that could have been used. I do have backups. I could restore posts. Only, I'm not going to. At least not right now. I planned to launch my Massive Reboot of my writing and illustration career in 2018 after finishing my MLIS degree program. I'm currently working on my plans. This month is going to be a month of reflection and planning. Right now I only have two goals to focus on this month. Write a short story each week. That's it at the moment. I've ordered Michael Hyatt's Full Focus Planner and look forward to using it in my planning efforts. I first heard about it through Amy Porterfield's excellent podcast. I'm not adding more goals until I have a plan worked out for the reboot. I work as a full-time librarian and need to take that into account as well. For the moment that also means that I'm not going to work on restoring my other sites or the content that was on this site. I will work on the site deliberately, with a plan. I hope you'll check back as I work through this process!